This quote wasn’t written specifically about Fab Labs, but it could have been. Entrepreneurship, innovation and technology are all at the heart of any Fabrication Lab. The Fab Lab concept began at MIT’s Center for Bits and Atoms (CBA), which is part of its digital fabrication and computation research. Although this is still an early concept, there are Fab Labs around the world. These are workstations and platforms for innovation. These are places to create, play, learn and invent. All Fab Labs are similar and they must share common tools and processes. The idea is that if something can be produced in a Fab Lab in New York, the same thing should be able to be reproduced in a Fab Lab in London. Fab Labs connects a global community of educators, researchers, innovators and students. Fab Labs share more than just common tools, though. They share knowledge and findings. Consider it a global laboratory that spans 30 countries and 24 time zones. Why Have a School Fab Lab? Instead of relying on a fixed curriculum, in a Fab Lab, learning is authentic, engaging and imaginative. Its creativity knows no bounds. Fab Labs give students the freedom they need to create the box, and then think outside of it. There is nothing quite like collaborating to create something bigger than yourself. Fab Labs help nurture tomorrow’s leaders, entrepreneurs and innovators. The picture above is from St. Stephen’s Episcopal Day School located in Florida. St. Stephen’s engages both younger and older students. They have a Jr. Fab Lab, and a Fab Lab for Grades 3-5 that engages students in longer projects than Jr. Fab Lab projects. They use their Fab Lab to drive STEM education with individual exploration and classroom collaboration driven by problem solving and discovery. How to Start a School Fab Lab? To get started creating your own FAB Lab outline a vision for your lab. Get input from students on what they would like to build and see in the lab. And if you need help with furniture to support your Fab Lab design – Interior Concepts can help you with just what you need for your space. Before you get started with building your Fab Lab, it’s best to send word of your intent to the Fab Foundation. They can help you get started and find funding, if necessary. After you have connected with the Fab Foundation, consider checking out Professor Neil Gershenfeld’s book: FAB: The Coming Revolution on Your Desktop – from Personal Computers to Personal Fabrication. 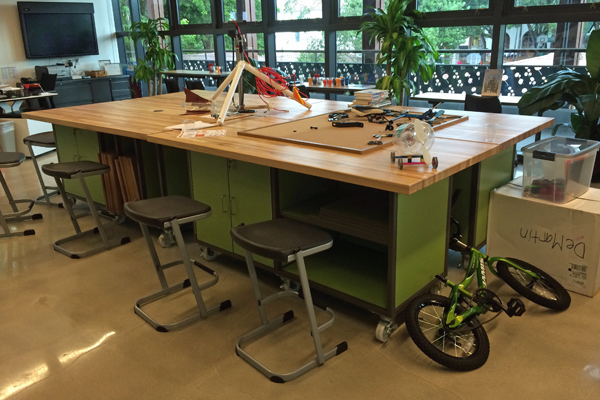 Create a team of qualified and trustworthy individuals to help you set up your Fab Lab. If you need help finding someone, the Fab Foundation may be able to help. They have access to a network of experienced innovators and the Fab Academy, which provides support and resources for teachers and educators. Working in a Fab Lab is not an individual task, nor is creating one. If you are working on designing your lab, please contact us to get started today.